The Panama Canal is an engineering marvel, known for being an ingenious creation when it debuted back in 1914. The Panama Canal helps ships safely and quickly travel from the Atlantic Ocean to the Pacific Ocean (or vice versa) without having to navigate around the entire circumference of North or South America. What makes the Panama Canal so innovative is its lock system that systematically fills and empties with water as ships go through it – raising and lowering the ship as it journeys through the canal. Experiencing the Panama Canal lock system is an experience best done on a cruise since you get to see firsthand how it works directly from the ship’s deck or your own private veranda. 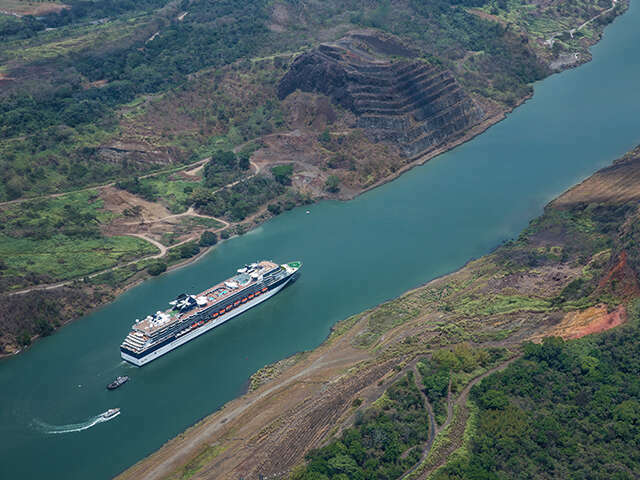 What Makes a Celebrity Cruises Sailing to the Panama Canal Stand Out? Celebrity Cruises sails along the Panama Canal between San Diego and Fort Lauderdale or Miami, Florida, making for easy flights to and from your cruise ship. Along the way, Celebrity Cruises stops in Puntarenas, Costa Rica; Cartagena, Colombia; Puerto Vallarta, Mexico; Puerto Quetzal, Guatemala, and other beautiful ports. You’ll also be cruising through the Panama Canal while vacationing in luxury thanks to Celebrity Cruises’ attention to detail with its impeccable service, fine dining, and premium entertainment. If the Galapagos isn’t already on your travel bucket list, it should be. This region of small islands off the coast of Ecuador is a biologist’s dream and a traveler’s wonder. You’ll see a dazzling array of flora and fauna as you travel to different islands. In and around the islands you’ll encounter the animals that call the Galapagos home, including giant tortoises, sea lions, marine lizards, and many species of birds. A cruise is the ideal way to visit these islands because you can only do so via a pre-arranged tour, and a cruise ship will let you relax on your veranda with a coffee or glass of wine as you watch the natural sites unfold around you. What Makes a Celebrity Cruises Sailing to the Galapagos Islands Stand Out? Celebrity Cruises has a fleet of small ships that are ideal for navigating the waterways of the Galapagos, including Celebrity Flora, a new ship being built specifically for the Galápagos Islands, that will debut in the spring of 2018. Click here to learn more about Celebrity Flora. Why It Should Be On Your Bucket List? Alaska is nicknamed America’s Last Frontier for good reason: most of the state consists of wild, untamed wilderness with jutting mountains and massive glaciers. Most of the cities and town are rich in history and character and are worth exploring. Why a Cruise is the Best Way to Experience It? A cruise lets you experience Alaska by land and sea. Sail through the gorgeous Inside Passage, travel past incredible icebergs in Tracy Arm Fjord to Sawyer Glacier, or sail to Hubbard Glacier and witness its incredible calving. In port, explore colorful fishing villages and remote hiking trails. What Makes a Celebrity Cruises Sailing to Alaska Stand Out? Celebrity Cruises offers Alaska cruise itineraries from Seattle, which is an easy to get to cruise port for many U.S. residents. Celebrity Cruises also has Alaska cruisetours, which combines your Alaska cruise with a multi-day escorted land tour that takes you deep into Alaska’s wilderness via train and coach. You’re not going to get around Antarctica by train or vehicle. Nope, a ship is what’s needed for a visit to this southernmost bucket list destination. Celebrity Cruises sails from South America to the northern edge of Antarctica — letting you effectively cross off TWO continents from your visit-all-7-continents bucket list item (we know it’s on there!). While sailing around Antarctica, keep your eyes wide open for whales, penguins, and magnificent ice formations. A cruise lets you traverse the icy waterways of Antarctica for prime views from the deck. When you’re not taking in the sights you can retreat to your luxurious stateroom or dine on multi-course meals. What Makes a Celebrity Cruises Sailing to Antarctica Stand Out? Celebrity Cruises makes Antarctica accessible by sailing to it from Buenos Aires, Argentina, during South America cruises that visit Antarctica. While in Antarctica, you’ll sail through Schollart Channel and the Gerlache Strait, and also see Elephant Island and Paradise Bay. That’s right – it’s not only destinations on this list. Traveling can also be about the experience and not just the place you’re visiting. In the case of Celebrity’s newest ship, Celebrity Edge, it’s an experience you won’t want to miss. For a truly jaw-dropping bucket list experience stay in one of the new suite classes that will debut on Celebrity Edge. The Edge Villa in particular will wow travelers looking for something different since it has two stories with floor to ceiling windows and a plunge pool looking out over the sea. That’s not just a bucket list item — that’s an Instagram-worthy bucket list experience! Not the type to splurge on a suite, but still like some luxury in your life? Celebrity Edge still has you covered thanks to the new Infinite Veranda Staterooms, which opens your entire stateroom to the outdoors with the push of a button. Celebrity Edge is transforming the way people will think about a cruise ship, from a cantilevered restaurant over the water (the “Magic Carpet”) to a pool deck that feels like a 5-star VIP resort to interactive dining experiences unlike anything you’ve experienced. When Can You Sail on Celebrity Edge? Celebrity Edge will be doing Caribbean and Mediterranean sailings during the 2018-2019 season, stopping in ports that will help you to check other items off your bucket list.